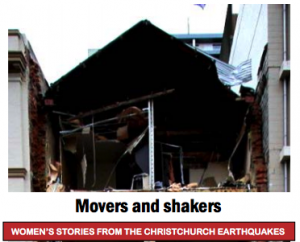 This is the final report of a research study undertaken by the National Council of Women (Christchurch Branch) between 2011 and 2014 with women living in Christchurch through the earthquakes. It tells their stories of the earthquakes and the aftermath, including community action, health, housing, insurance woes, families, children and many other themes. It is a compelling first-hand account that has been created ‘for posterity’. The partner material is the individual stories stored on www.ceismic.org.nz/quakestories. Please note that the document has been created in ebook format and is around 380 pages in length. Creator: Gordon, L; Sutherland, J; DuPlessis, R and Gibson, H.